Dahabiya Nile Cruise: the classic way to see the Nile. Sail into the past and travel the Nile like the pioneering voyagers aboard a traditional Dahabiya. A Dahabiya Nile cruise offers the romance of the past with modern comfort and convenience. It’s a leisurely way to get between Luxor and Aswan and brings together superb sightseeing, sailing, delicious traditional meals and attentive personal service. A day on board a traditional Dahabiya has many pleasures. You can lie in a deck chair, read a book or watch children playing and women doing their washing. Every day there is a chance to walk around villages, visit local markets or explore monuments along the Nile. Meals are freshly prepared on board and served on the sundeck, in the dining room or on a beautiful spot on the banks of the Nile. There’s nothing better than an evening dining under a twinkling night sky by the light of a campfire. You are far away from the fancy-dress parties of the large cruisers. You’ll find no flashing disco’s here, but it might be possible to attend a show by local musicians under the stars. Accommodation on board consists of four comfortable, large cabins and one or two spacious suites. All are individually decorated with authentic oriental furniture. They have their own bathroom and can accommodate up to two people. Our Dahabiya boats are fully air-conditioned and heated with individual controls. The half-shaded sun-deck is the heart of the Dahabiya, with chairs, a divan, sun beds and dining tables. This is the perfect place to enjoy daily life on the riverbanks and watch the landscape gliding by. Our traditional two-masted Dahabiya boats are based on the design of original Dahabiya boats from the late 18th and early 19th centuries and are powered by the wind only. No engines! You only hear the sound of the breeze through the sail and the water breaking over the bow. Our three Dahabiya boats sail up and down the Nile between Esna and Aswan. We offer a guaranteed choice between two itineraries. Upriver from Esna to Aswan, 4 nights and downriver from Aswan to Esna, 3 nights. No minimum number of passengers, with fixed dates for each trip on each Dahabiya Nile cruise. We’re the proud owners of 3 beautifully crafted traditional Dahabiya boats, with 5-6 luxurious cabins & suites each. They are also available for private charter. 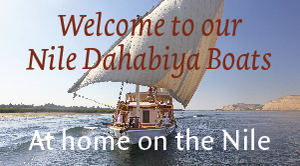 See also our Nile Dahabiya Boats website. Dahabiyas sail back and forth on the Nile between Esna and Aswan. Along this part of the river, you will find a high concentration of monuments. For example the well-preserved temple of Horus in Edfu and the legendary double temple of Kom Ombo. Both temples are also visited with a regular Nile cruise. But the relatively small, manoeuvrable Dahabiyas are also able to get to less accessible monuments, islands in the river and villages along the banks, where the huge cruise ships never moor or come. Among them is El Kab, the ancient city of Nekheb with temples and rock tombs from the Old Kingdom. Gebel el Silsila is another jewel that the huge Nile cruisers pass by. Our Nile Dahabiya cruises will carry you to secluded spots, picturesque and quiet, far away from the crowds. You can go for a walk, visit a local market or explore the Egyptian countryside. An English-speaking Egyptologist will guide you. The tour price includes all excursions and entrance fees. Our Dahabiya boats are designed for sailing the Nile. Due to the prevailing wind, more sailing is possible upstream towards Aswan than downstream towards Luxor. Even the ancient hieroglyphs show this: a boat with a sail is sailing south – upstream, a boat with oars is heading north – downstream. Luckily each of our Dahabiya has its own small tug that can help if the natural elements fail. The same sites are visited in both directions. El Kab is one of the oldest settlements in Upper Egypt. Here are the temples and ruins of an ancient city, dedicated to the goddess Nekheb. An impressive wall of mud brick surrounds the town site. You can also see rock-cut tombs decorated with scenes of everyday life and the afterlife. A team of Belgian archaeologists is excavating this area since 1937. The temple of Edfu, dedicated to the falcon god Horus, is one of the largest temples in Egypt. For centuries, this temple was hidden under the desert sand, so it has been preserved almost intact. The great court, hypostyle halls and shrines are completely decorated with beautiful reliefs. This is where the ancient quarries of Karnak and other temples are situated. Thousands of workers cut sandstone here to supply the pharaohs with their favourite material, used for building temples. The archaeological remains include a rock-temple of Horemheb and funerary chapels cut into the cliffs. Gebel el Silsila means ‘mountain of the chain’. The Nile river is at its narrowest here, therefore only Dahabiyas are able to moor at this site. The temple in Kom Ombo is the only double temple in Egypt. It’s dedicated to the crocodile god Sobek and Haroeris, the falcon-headed god. The main characteristic of this temple is its symmetry, with twin entrances, sanctuaries and hypostyle halls that are divided down the middle. Daraw was once the last stop of the historic Forty Days Road between Sudan and Egypt. The famous camel market at Daraw is the only market in South Egypt. Merchants buy their camels here and truck them to Beqash, near Cairo. From there the camels are shipped all over North Africa and the Middle East. Departure from any address in Luxor to Esna (50km south), home port of the Dahabiya. Embarkation on the Dahabiya for a 4-day cruise along the Nile between Esna and Aswan. A visit to the Esna temple and a short walk through the local markets. Sail to El Kab, the ancient town of Nekheb, to visit the remains of its temples and some of the tombs cut into the cliffs. Set sail for a small island where the boat will moor for the night. You will have dinner on board the Dahabiya or on the tranquil banks of the Nile. First night on board. Sail for Edfu and visit the temple of Horus, the best-preserved of all the temples in Egypt. Set sail for a small island where the boat will moor for the night; later stops will take you to small villages and the desert. Second night on board. Sail to Gebel el Silsila and explore the ancient sandstone quarries and rock-cut chapels of Horemheb, Seti I, Ramesses II and Merenptah. The journey up the Nile continues towards the double temple of Haroeris and Sobek in Kom Ombo. Set sail for the island of Maniha, where the Dahabiya will moor for the night. Third night on board. End of the Nile Dahabiya cruise journey in Aswan after breakfast on board. 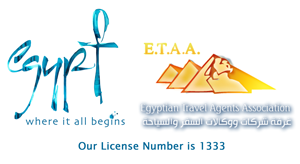 Transfer to any address in Aswan. Optional excursion to the temples Abu Simbel is available at an extra charge.